Leaning Star Winery: Wine Tasting, Potluck, Dead Mower! Wine Tasting, Potluck, Dead Mower! As you know I always love to be outside in the garden this time of year. New things blooming everyday. 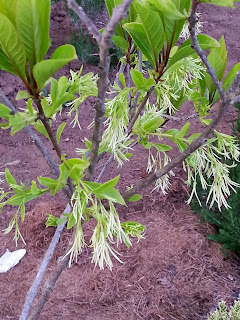 This is my little fringe tree, or cheonanthus. It will grow and fill out quickly, but for now it is still a little sparse. I love it, we have a BBQ and Wine tasting coming up with the West Columbia Gorge Chamber at the end of this month, so it's on my mind. The riding mower croaked, good timing, so last night Howard and I took turns zipping around with the push mower. Trying to keep on the grass, it gets so crazy this time of year. So parts are ordered for the riding mower, hopefully they make it in soon. It used to be so easy when the Sears service center was around, now ordering on ebay.